Overlooking Liberty Street, the Excelsior Room’s romantic glass bulb string lights and lofty minimalist décor add class to musical acts whose well-developed sounds already far surpass the aesthetic of twinkle lights in a dingy college basement. 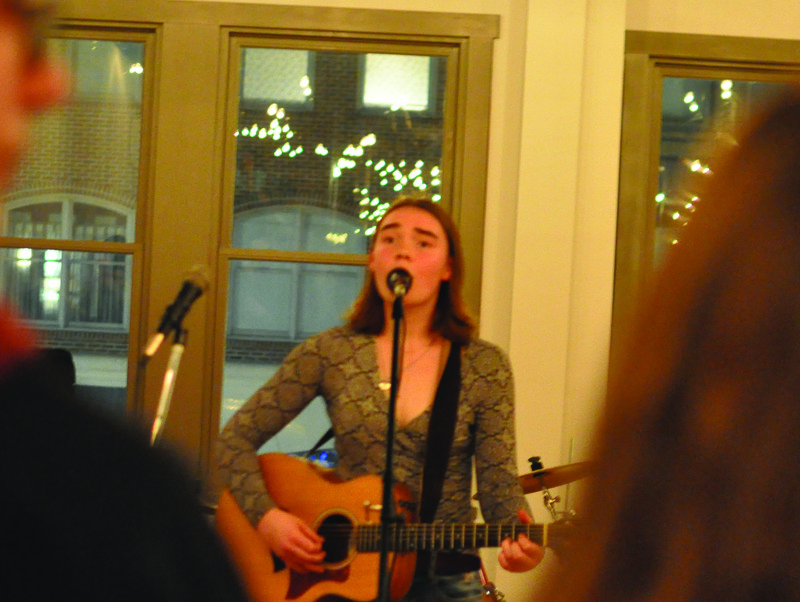 Last Friday, the event hall above Spoon Market in downtown Wooster hosted four College of Wooster music acts — Ted Murray ’21, Kate Atwell ’20, Part Time Uncle and Kite Mike — in a concert bridging the College’s music scene and Wooster community listeners. Singer-songwriter Murray opened the late-night show with a handful of original songs written for guitar. Murray drew in the crowd of nearly 100 people with a balance of reflective and upbeat jams. The intimate, seated performance served as a contrast to Murray’s swinging collaboration with Kite Mike later in the night. Next, Atwell, another seasoned singer-songwriter, performed several personal narrative songs that reflect her coming of age along the shores of Puget Sound in Washington. Songs like “Mama’s Song” and “Stripes” highlight her earthy, soulful album, which she has published as a CD and on Spotify. Similar to the other acts, this marked Atwell’s first foray into performing for the larger Wooster community, though she has performed as a student opener for the WAC Small Concert series and in her hometown. Like her voice, her stage presence is unwavering. Her memorable cover of Rhianna’s “Love on the Brain” only reinforced her controlled pipes. The crowd visibly drew nearer to the stage to welcome Part Time Uncle, who started things off with “Catch Me If You Can” from their EP “Drunk in Lowry.” With their music now available on several platforms, including Apple Music, Spotify and SoundCloud, the crowd’s familiarity with the lyrics lent the live performance a rockstar feel despite the small venue. Part Time Uncle has made a name for itself on campus by playing at Bonnawoo and other school-sponsored concerts. They will also play at Lumberjack on April 14 and Springfest on April 21. However, they also hope to continue to share their music off campus. “Our Spoon show was the first time we got out and played in the community. It was really exciting! We were happy to spread our music to a new crowd,” the band said in a statement. Kite Mike closed Friday’s show with an encore performance. Their set list included original songs “BMajorF,” “Joan,” “Old Things” and “Stillwater.” For the encore, the band performed “Reunion.” Their music has something for everyone to nibble on. Sonically cerebral and full of unexpected breakdowns, it would make your music teacher applaud and then pop, lock and bust a dance move. The band consists of members Isaac Scher ’18, Sam Delano ’19, James McElroy ’18 and Gabe Dale-Gau ’18, all of whom share the sentiment that performing in the community is a positive experience. “Though we gathered a primarily student audience, the evening provided an intersection between spheres of the Wooster populace for whom we do not often perform. Original music provides a unique opportunity for community engagement, given that concerts establish shared experiences with everyone present. It is easy to see that you have something in common with a stranger when you are both jamming to tunes neither of you have heard before,” the band said. The band also hopes to continue performing off campus. “The staff at Spoon was welcoming and accommodating, and we would love to return later this semester with new music and a growing audience. Hopefully this is the first of many performances at venues in the community,” they continued. On the flip side, community partners are also receptive to continuing to feature student performers.